Bring some magic to the day with a Unicorn Fruit Tray! They’re colorful, magical and mysterious… it’s no wonder kids (and, who are we trying to kid here, adults too) find unicorns so very appealing. This fruit tray brings some extra magic to any table. A unicorn fruit tray would make a perfect centerpiece for a child’s birthday party or St. Patrick’s Day party. The most amazing thing about this tray is just how customizable it is! Fruit comes in all colors of the rainbow, and as long as you’ve represented each color, you’re free to swap our fruits for your favorites. We have offered suggestions for which fruits to use in the recipe below, but you can use which fruits you want. Some other alternatives to consider? Watermelon, blackberries, bananas, orange slices, and apple slices. This fruit tray is truly easy to assemble. First, place a cream cheese fruit dip in a bowl and place the bowl near the top of your platter. An oblong platter works best for this fruit tray. Use the skin of a kiwi to create the eyes and eyelashes of the unicorn. Use a triangular wedge of pineapple to create the unicorn’s horn. For added detail and dimension, place a few strips of mango diagonally across the pineapple. Use two strawberry halves for the ears. You can add a triangular sliver of honeydew on top of the strawberry ears to give them more dimension. Then, simply arrange the fruit by color on a slight diagonal, starting with warm colors and ending with cool colors. We like to add a few pieces of starfruit around the tray for a little extra sparkle! To make this tray even easier, use pre-cut fruit from the produce department. It’ll be a little more expensive, but it’ll save you the time of washing and cutting the fruit yourself. You could also use a premade fruit salad from the produce department. Separate the fruit out by color and arrange like normal. Place a bowl of cream cheese fruit dip towards the top of an oblong platter. Use the skin of a kiwi to create the eyes/eyelashes of the unicorn and place on top of fruit dip. Use a triangular wedge of pineapple to create the unicorn horn. Lay 3-4 strips of mango diagnoally across the pineapple. Use two strawberry halves to create the unicorn ears. Place triangular slivers of honeydew ontop of each strawberry to give the ears dimension. Arrange fruit by color in diagonal rows, beginning with warm colors and ending with warm colors. Add a few peices of starfruit to the tray for added magic! Fruit selection is just a suggestion. You can use whichever fruits you'd like! PRODUCE MOM PRO TIP: Have a lot of people coming to your party? Pair a Unicorn Fruit Tray with a Rainbow Fruit Tray for the ultimate magical experience! 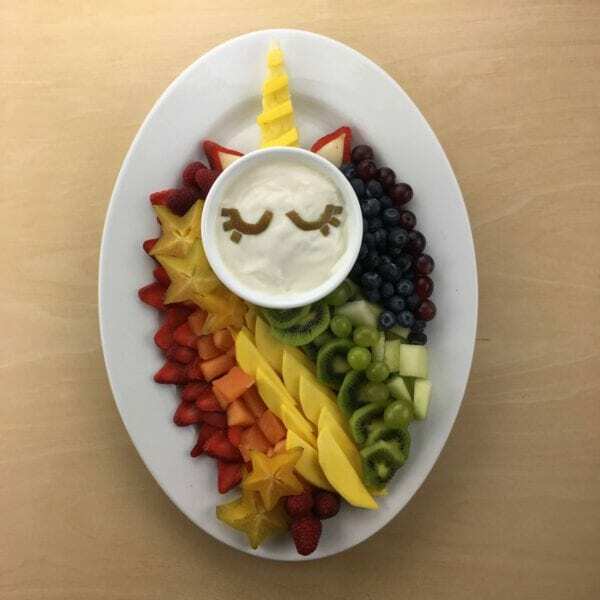 We hope this Unicorn Fruit Tray brings a little magic and lots of smiles to your day! What party/event will you make it for? Which fruits will you use? Let us know in the comments below. Get more fruit and veggie party platter ideas here or download our free eBook, A Fruit and Veggie Tray for [Almost] Every Holiday.